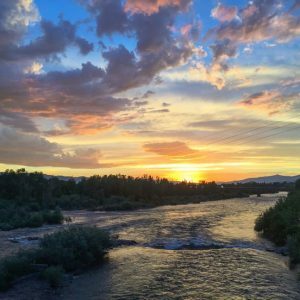 Introducing The River Pub, a new way to experience the river through Missoula, pub style! Comfortable seating, with a wood bar table top. Relax under the canopy while your guide does the rowing. The River Pub can be chartered for any event, gather your friends and bring along a growler of your favorite Missoula craft beer or beverage. Take the River Pub to an event downtown, Osprey Game or Concert. Have your event catered by one of the many Missoula’s restaurants or guest chef, the possibilities are endless. Want a new venue for your next business lunch? Have lunch catered, enjoy the scenery of Hellgate Canyon and privacy of the River Pub. Prefer the quiet morning light and bird watching? We are teaming up with Drum coffee or your favorite bakery to offer morning trips with their delicious brew and unique sandwiches and pastries. Float through town with Pub Style Seating! Departure times 11am and 4pm OR custom departure times. We meet at headquarters at 912 E Broadway OR your choice of lodging or brewery or other. We can provide meat & cheese trays, classic deli lunch or other local food – let us know! Custom departure times and catering are available, let us know about your event we can make suggestions. Capacity is 10-12 guests and includes guide/s and shuttle transportation. Flowing through the heart of Missoula, MT, the Clark Fork River offers a unique river experience right in town. We offer two different “Town floats” – the classic Milltown to Downtown is a scenic float starting in East Missoula at Sha-Ron river access or at Weigh Station on the Blackfoot River where you can paddle into the confluence of the Blackfoot & the Clark Fork River, passing through Hellgate Canyon, a small drop near Jacob’s Island (University of Montana) and hit Brennan’s wave downtown at Caras Park, take out at Silver Park near the Osprey Baseball Stadium. West of town, we offer the Kelly Island to Kona Bridge trip – this section of river meanders through Cottonwood groves offering amazing birding & wildlife opportunities for such close proximity to town. We also pass the confluence of the Bitterroot & Clark Fork River. Just downstream of the confluence is where Lewis crossed the Clark Fork on the return journey in 1806 via the Blackfoot river and Rogers Pass continental divide crossing. 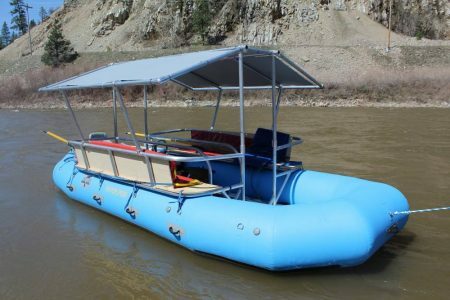 Both of the above are appropriate for families with young kids looking for an introduction to rafting before paddling whitewater and/or birding opportunities. This section of the Clark Fork can be run anytime, but for warmer weather and water temperature, we recommend end of June (sometimes later) to September. For more whitewater the Clark Fork’s Alberton Gorge is a great Class III whitewater run. For bigger more extreme whitewater, the best choice would be the Lochsa River. The “Clark’s Fork of the Columbia,” named after William Clark, is a major tributary of the mighty Columbia River. 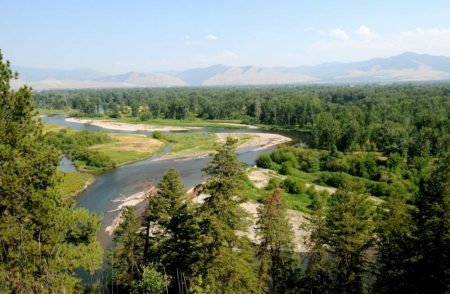 Why didn’t Lewis and Clark take the Clark Fork River instead of their arduous journey over the Lolo Trail? 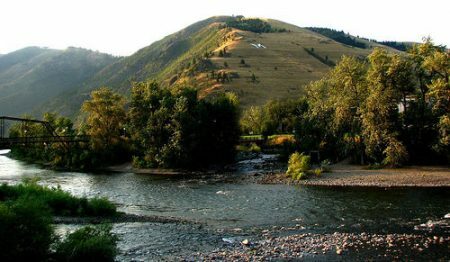 After deciding the Salmon River was too rough and banks to steep they traveled down the Bitterroot River and came to the Missoula valley. Lewis & Clark debated the best route to the Pacific with the guidance of their native American guides new they needed to reach rivers and waters with salmon. This would ensure they were on the drainages that eventually flowed to the Pacific. The Clark Fork did not have salmon. Even though the Clark’s Fork does flow to the Pacific. We use our regular paddle boats with guide in the stern. Included full BBQ dinner. Call us for a custom sample gourmet menu. Group size minimum of 6 to make any of the above trips go. Inquire if you have less than 6 to join a trip. Departs 12:30pm and returns approx 8:00pm, relaxed pace. Call us for a custom sample gourmet menu. Custom trips available for variety of trip length & group size, inquire for pricing. Minimum group size required for a trip to launch, please call ahead to reserve and ensure trip departures. Clark Fork Town trips usually depart from our office at 912 E. Broadway, Missoula MT, we can also meet you at the one of the river put-ins or take-outs or custom pick up location can be arranged for large groups. Return times are estimations and depend on water level, allow for delays. Minimum age limit usually 6 years old, but since this trip has very little whitewater, we can consider a younger age, inquire for details. We provide a professional whitewater guide, transportation to and from our office, paddle, Coast Guard approved PFD and beverages for the return drive. "At this place is a handsome stream of very clear water, 100 yards wide, with low banks, and a bed formed entirely of gravel. It has every appearance of being navigable; but as it contains no salmon, we presume there must be some fall below which obstructs their passage. Our guide could not inform us where this river discharged its waters....not far from our present position it was joined by another stream nearly as large as itself, which rises in the mountains to the east near the Missouri."